With 1 gig networks it is important to tune per path settings for maximum throughput. The default of 1000 IOs per path can cause micro bursts of saturation and limit throughput. I've done a fair amount of testing and found that the best setting is to actually change paths based on the number of bytes sent per path. The reasoning is that it can be detrimental to change paths too often for small block IO. Setting the path change to bytes optimizes for both. Here is a real world example from a demo I recently conducted. This was done with 4 1G interfaces on both the Nimble array and the ESX host connected through a Cisco 3750X stack. Notice the large improvement in not only throughput but also the reduction in latency. The latency in the first test was due to the saturation of the 1G links. Why did you choose "-B 262144" as the bytes size, what other options/results did you test with? I assume this was the best overall balance between IOPS and Throughput? I did try several other options. Setting it to 256K per path seemed to be the sweet spot. This is great Adam Herbert greatly appreciated. I have seen this in a couple installs now, and will put this in my toolbox of changes for 1G installs. Adam Herbert Thanks for this. Can this command be run on an environment that already has VMs on the iSCSI LUNs without an interruption of service? Yes, it has an immediate effect and the way the script is written it only affects Nimble Volumes. It is also relatively simple to modify the script to only affect an individual volume if you so wished. Yes, it is safe to run. No downtime needed. have you guys tried iops=0, this essentially ignore the # of IOPS per path before switching, and relies on queue depth. Essentially poor man's LQD on ESX! We are trying to do some testing in tech-marketing lab to get some results. Yes setting the policy=iops with both iops=0 and bytes=0 may give better performance, where MPIO doesn't need to wait for 256K before switching path. I would be interested in seeing the results of the tests. When I tried using low IOPS per path numbers I saw small block random performance degrade. I did not try setting IOPS per path to 0. I didn't even know that would be a valid input! Yes, definitely. Assuming you have dual 10G bind to the iSCSI initiatior, PSP_RR will leverage both paths without having to wait for a given path to reach X IOPS or X bytes before the switch. Is this (or iops=0/bytes=0) going to end up in the Nimble VMware installation guide? it is making its way to the next edition of the vsphere on Nimble best practices guide - the same will go into the next edition of the vmware integration guide as well. Made the change. My SQLIO test throughput on 10G on Reads went from ~470 MB/s to ~715 MB/s. Have a CS240G. NICE! wow nice to hear Craig! I may be wrong, but when making the change to --iops=0 & --bytes=0, it looks like you have to set '--type' to 'iops'. I tried it using '--type=bytes' as written in the script above, but the iops limit didn't change. Set the type of the Round Robin path switching that should be enabled for this device. bytes: Set the trigger for path switching based on the number of bytes sent down a path. default: Set the trigger for path switching back to default values. iops: Set the trigger for path switching based on the number of I/O operations on a path. I just ran the command twice, one to set bytes, and then one to set IOPS. Since there is a Limit Type, I'm not sure if it matters if you changed bytes to 0 if the Limit Type is set to Iops. In the SSH console on ESXi 5.1, this command will loop through each datastore setting Bytes to 0, IOPS to 0 and then display the current settings. For some reason, when listing disks, they show up twice, once with their regular ID and a second time with the ID ending in :1 and the settings can't be applied. I did both Bytes and Iops to 0 with IOPS being set as the active Limit Type. 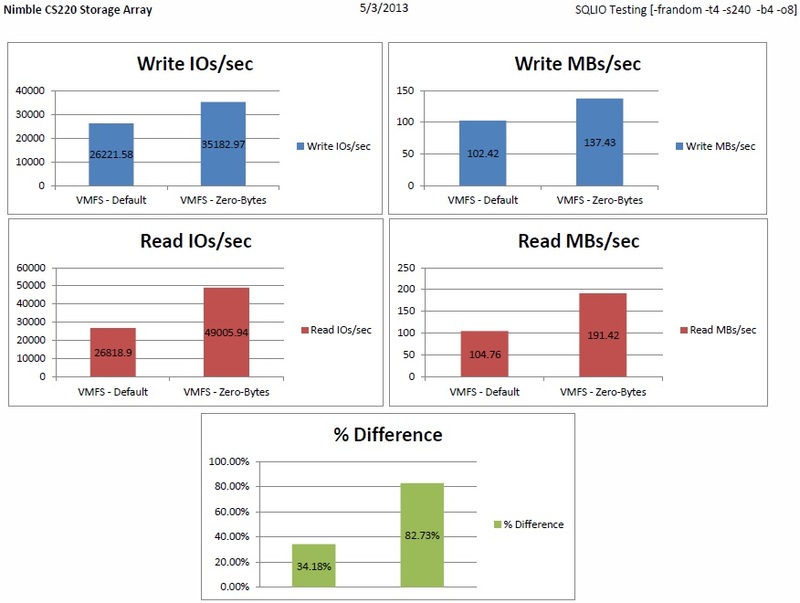 64 byte 100% reads with 5 workers an a 2 GB test file in IOmeter shows an increase from 1649 IOPS and 102 MB up to 2644 IOPS and 171 MB on a single VMDK over 1x4 GB links. Writes did not seem to be improved in my case. Shawn, that's great to see those results! I would suggest that you try a before and after with a large block (64k) sequential workload. You will probably even see a more dramatic difference. It is suggested that instead of using the IOPS setting to use the BYTES setting, so that each path change would not happen until the packet size was closer to matching the ethernet size. We ran various test (same setup as Adam's) and found that on HOST using normal frame packet size our optimal settings were IOPS=0 BYTES=512, this gave the best overall read and write numbers. IOPS=0 BYTES=1400 also gave good numbers (slightly better write times than 512). Also ran the same SQLIO test using jumbo frames and we could not get any performance increase using any combo of setting (IOPS=0/1000 BYTES=0/512/1400/8800). The default (IOPS=1000 BYTES=10485760) gave the best overall performance. The jumbo frame issue might be related to network congestion or our need to upgrade to a CS440 controller (hopefully ordering soon). Is there a preferred BYTES setting or are we on the right track with either of those options?